Secure in-car magnetic smartphone mount with built in wireless charge. The AERPRO APWMVLOK MAGNETIC WIRELESS CHARGER KIT - VENT/DASH is a simple, safe and convenient wireless charge smartphone mounting solution that can be positioned on the vehicles air vent or dashboard. Attach the included steel plate to the back of a smartphone and the powerful strong hold magnets will ensure the phone remains secure at all times. The kit includes a USB cable and dual USB charger that connects to the vehicles accessory power socket. One charge port connects to the holder leaving an extra charge port free for connecting other devices in the vehicle. The holder also features a LED Indicator which displays the status of the wireless connection. 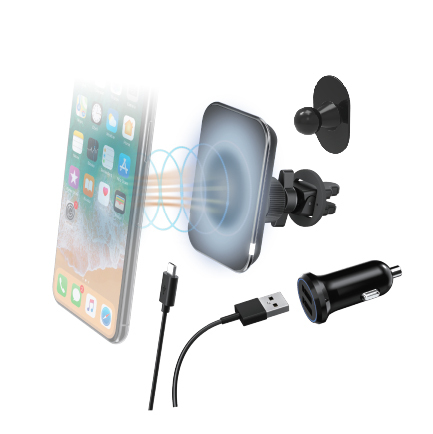 Suitable for Apple and Android wireless charge smartphone devices, the APWMVLOK is the must have accessory if you are looking for a hassle free mounting and charging solution for your vehicle.